production, logistic and transport while maintaining a desired low temperature range which is necessary to preserve and maintain the shelf life of products like agriculture produce, sea food, frozen food, pharmaceutical products and medicine, chemicals and other products which if not preserved using cooling will get deteriorate from their quality standards. There are products that don’t require cold chain to storage but they also need to be protected from the elements and kept under a controlled climate, e.g. rice and wheat. There is definitely an impact of environmental conditions on every produce. Yuktix provides an efficient and reliable cold storage and warehouse monitoring solution under the “COLDSENSE” brand. 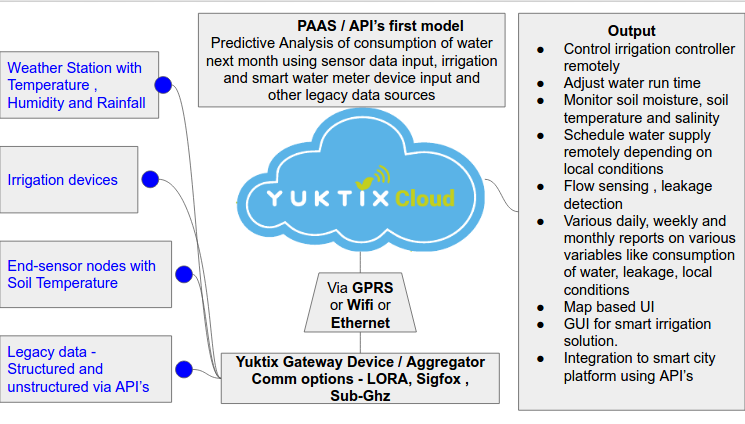 Yuktix provides wireless sensor nodes (Temperature, humidity and gases), Solar powered and grid powered gateway with edge software and Yuktix sensorDB product to store and analyse the data. You can easily monitor warehouse internal environment data from anywhere using our wireless sensors and gateway. You can download and analyse the data using sensorDB. You can do continuous 24×7 monitoring of product storage conditions. For example red chili should be stored between 6 degree – 8 degree Celsius. Few days deviation might not effect the quality but if deviation continues for few weeks or a month, it can result in quality reduction and hence export worthiness of the chili. Yuktix COLDSENSE allow you to set alerts using SensorDB and alerts are send to you on SMS or email as soon as a sensor reports deviation from the prescribed range . Sensor based automatic control of the irrigation line – An automatic version of the previous solution can be done by measuring the soil moisture with the help of conductance based soil moisture sensors. You then start the irrigation pumps depending on the actual soil moisture conditions. Some companies which are active in this are Corpx, FarmX, Farmobile, Edyn, Hortau, tevatronic, Aquaspy.